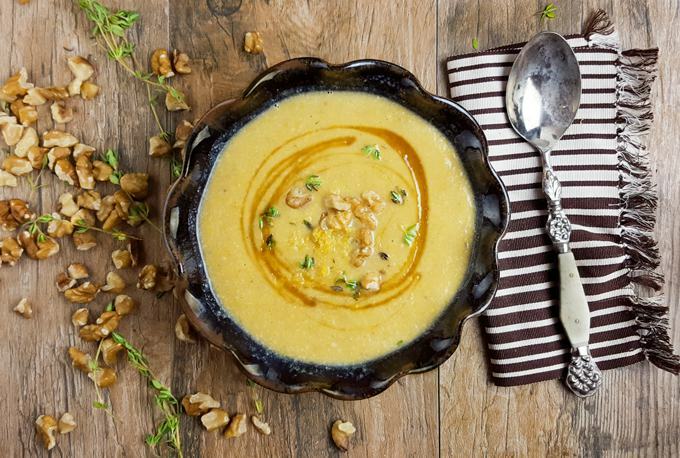 If you love a good, local honey, this soup’s for you. It takes on a slightly complex flavor from the walnuts and thyme, and the zucchini adds creaminess without the need for dairy. The real standout feature, however, is the drizzle of honey that perfectly complements the nutty undertones. You can also follow my lead and drench it in honey, I won’t tell if you don’t. Toast the walnuts in a pan over medium-high heat, stirring occasionally. It will take 3-7 minutes. Chop onions & smash garlic: Chop the onions now, and really, consider doing this next to the toasting walnuts so you can keep an eye on them. Smash the garlic, then pull them out of their skins. Saute onions: Heat olive oil in your favorite soup pot over medium heat. Add onions and saute until they start to soften, 5-7 minutes. Meanwhile, chop the zucchini. Cut it in half or quarters, length wise, then chop into 1/2 inch thick pieces. Add in the garlic, saute for a couple more minutes. Add other stuff & simmer: Add in the walnuts, zucchini, bay leaves, salt, thyme and broth. Bring to a boil, then simmer for 20-30 minutes. Scoop into bowls, and drizzle with honey (1 tsp per bowl). Garnish with zest and extra thyme leaves. *Dried thyme works if needed. Taste the soup as you go to see if you should add more. * Yellow zucchini makes for a slightly prettier soup, if that's your thing. Yellow summer squash makes a prettier soup. It turns out a nice yellow-light-brown, if you’re serving this to guests. Green zucchini will taste the same, so don’t fret if that is what you have on-hand. On timing – if you’re methodical about it, you can make this whole thing very quickly. As noted, chop the onion and smash the garlic while the nuts toast. Then while the onion simmers, you can chop the zucchini and pick the leaves off the thyme stems. You can get this as low as 15 minutes of active time, including all of the prepping and sauteing. I’ve had this in mind for a while, waiting for my summer crop of zucchini to ripen. 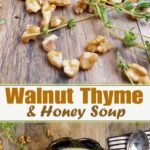 Thanks to Kellie at Food to Glow for posting this charming and heartwarming soup. 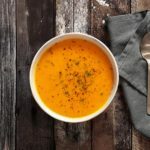 I haven’t run across her blog before, but after the huge success of this soup, I’ll be scrolling through her recipe pages (probably for hours). She’s really focused on nutrition and health, right up my alley! I made a couple of tiny changes. First, I used less vegetable broth to make it really creamy. It’s easy to add more if you like a thinner soup. 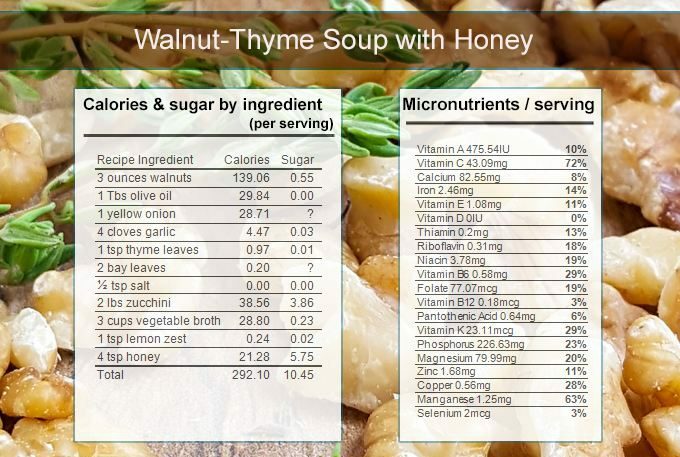 Second, she suggested adding honey if the soup was bitter… but the minute she said “honey” I started thinking of how well honey compliments nuts. So I have determined this is a “must-have” to give the soup that “wow” factor. Plus local, craft honey has wonderful health benefits.